Harald Juhnke first appeated on the stage in 1948 at the Haus der Kultur der Sowjetunion in Berlin. In 1950 he was engaged in Schwerin and at the Freie Volksbühne in Berlin. In further years he worked in Hamburg, Cologne, Düsseldorf and Munich. He married the actress and dancer Sybil Werden in 1952. They had two children but divorced in 1962. In the 1953 he had started a movie career as well. He appeared in over 70 films. From 1963 to 1971 the actress Chariklia Baxevanos (b.1936) was his companion. In 1971 he married the actress Susanne Hsiao (b.1944). They had a son in 1972. In 1979 he became the moderator of the popular German television programma "Musik ist Trumpf", but his problems with alcohol put an end to the program in 1981. In 1987 was engaged at the Renaissance-Theater in Berlin. In 1993 he made his reappearance in movies and he received the Ernst-Lubitsch Prize as well as the Bayerischer Fernsehpreis. In 2000 he was forced to end his career after the Korsakow syndrom was diagnosed. He lived in a nursing home in Fredersdorf-Vogelsdorf near Berlin until his death in 2005. 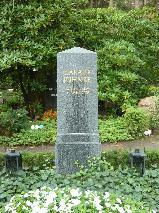 The grave of Harold Juhnke at Waldfriedhof Dahlem, Berlin.